– Where did you park the car? – I will always remember you. You have helped me so much. – Suddenly I remembered that I had promised to ring my mother. 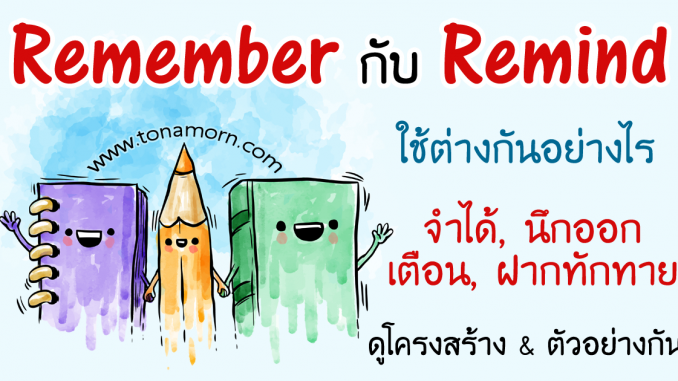 Remember + to-infinitive หมายถึง จำไว้ว่า.. ไม่ลืมที่จะ..
– Remember to save your work often, just in case your computer crashes. Remember + v. -ing หมายถึง จำได้ว่า..
– I remember meeting her once. It must have been about five years ago. – Remember me to your parents when you see them. – That song always reminds me of the time I fell in love with an American girl. – Adam reminded me of my father. They had the same eyes and the same way of talking. – Remind me to email Somsri today; otherwise I’ll probably forget. – Please remind me to post this letter. – He’s probably forgotten he was supposed to be here at 6. Shall I ring him and remind him?